This week second and third grade classes had very similar visits with me. We talked about the upcoming author visit at the Coralville Public Library. This next Monday night Dori Hillestad Butler will be visiting the Coralville library to promote her newest book. 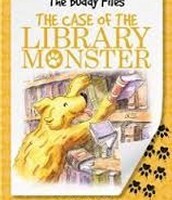 I am working with her to schedule an author visit with our school via Skype and in preparation for this second and third graders are reading The Case of the LIbrary Monster together in the library. 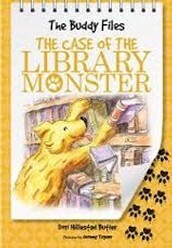 The Case of the Library Monster is from Dori Hillestad Butler's The Buddy Files series and is a Goldfinch Award nominee this year as well. The children enjoyed the first two chapters of this book during class time this week. The main character is Buddy, a therapy dog that gets to spend his days in an elementary school and likes to think of himself as a bit of a detective. He is currently trying to decide if he thinks there is a ghost in the school because of some rumors kids like to talk about. Buddy is a funny narrator and kids enjoy listening to him talk about his adventures in the library. Let me know if you have any questions about the library or if you would like to volunteer!